I don’t know whether Bertil Hörberg is feeling lucky or not, but I’m sure the main character in his wild west adventure is glad to finally be on the PC after being in a mobile exclusive game. But is this trip back to when guns did the talking worth taking, or is being a gunslinger not all it’s cracked up to be? 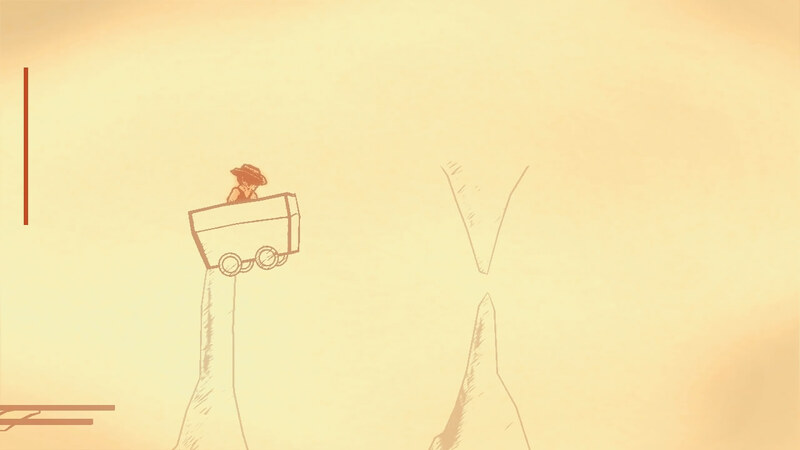 Unlike the deep plot that drives certain westerns, Gunman Clive is far more run’n’gun than a complicated story: At its core, it’s another damsel-in-distress scenario but don’t cast it aside because of that, since the action more than makes up for what the plot lacks. 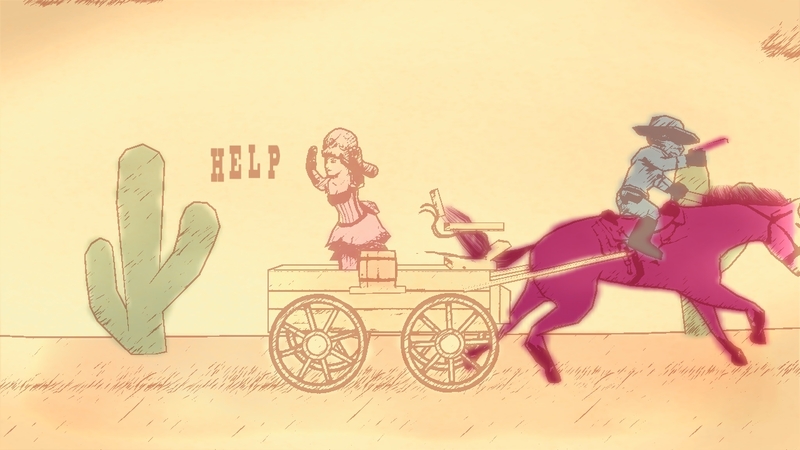 Each stage feels just different enough to keep things fresh without straying too far from the path, and the unique art style combined with the music (which is different in each level), aid in creating the illusion of actually being in the 19th century. As long the immersion factor is high in a wild west game, who needs a deep involving story? Chances are it would get in the way of shooting them bad guys anyway! A few things do remind you that this is a game however, such as unlimited ammunition and countless retries – not that there’s anything wrong with either, mind you. They don’t make the game a breeze after all, because dying sends you all the way back to the beginning of the current stage! And no number of bullets are going to make the tricky platforming sequences any easier, nor are they going to help with the difficult boss battles as these can take quite a beating (or shooting?). Now, normally I’d say that there shouldn’t be boss encounters in a western game, but in this one it (almost) works. I won’t spoil them for you, but I will say this: Some of them certainly reminded me of classic video game villains, although that could just be me getting my nostalgia on. 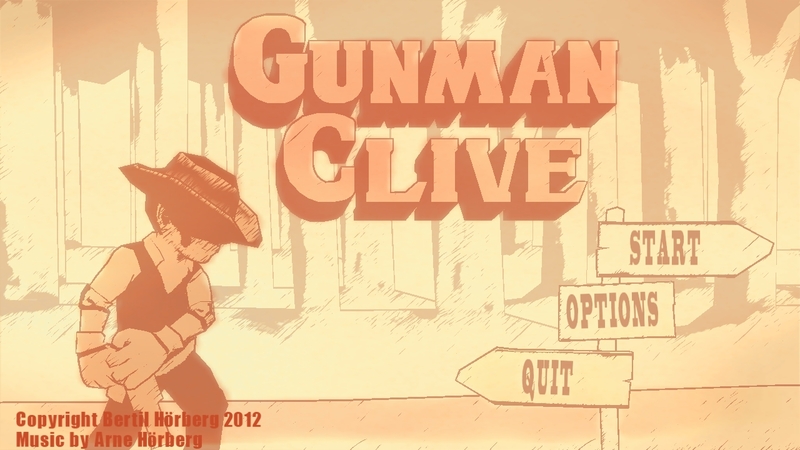 At certain points the game mixes things up quite a bit with some rather unique areas to traverse and while I accepted the presence of boss battles, a few of the levels in Gunman Clive feel out-of-place; even if this is a video game and not a 100% accurate wild west story. For a mobile-to-PC port, this one certainly has a feature set other games can only dream of: Controls can be remapped, resolution changed, it’ll run it either a window or full-screen, sound and music levels can be adjusted separately and the “Sketch Flicker” (fancy name for the visual effect) can even be turned off. On top of that, the controls are tight and responsive so you’ve only got yourself to blame when you die (and die you will); plus there are no load-screens, so you’ll be back in the action in no time at all. In case I wasn’t being clear enough: Buy this game the second you’re done reading this review. It’s reasonably priced and available on both Desura and GamersGate for PC (the version reviewed). Those who prefer mobile gaming can pick it up on iTunes (iOS) or Google Play (Android) instead.